The cost of reliable healthcare is rapidly increasing leaving some businesses struggling to negotiate a cheaper price. However, no healthcare providers are giving good enough reasons for these cost increases. As an HR Manager your duty is to appease your organization and employees by providing them with the best benefits available. For this reason, endless negotiations occur, but sometimes the solution can be much easier to come by. 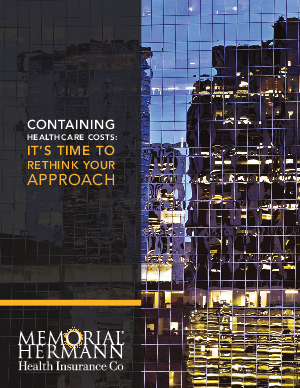 Download this whitepaper to see how your solution can be as simple as changing healthcare providers and see how Hermann Memorial Health Insurance can achieve what your former providers could not.